You can earn a 'Transum Trophy' for completing this activity here. I love you website I use it every maths lesson I have with every year group! I don't know were I would turn to with out you! It was good because it used up half a maths lesson and we all worked as a team. I found it impossible and so did the rest of my class! We are finding this very challenging but we enjoy the challenge!!! We have not found a solution yet! Has Done it!!! Brilliant, well done Craig! We found this starter a little challenging to start with but once we had realised that 1 and 8 were special numbers and that they had to go in the middle we found it easy !! :D.
D.M. took 3 minutes to complete. Placed 1 and 8 in centre at start since these seats have most adjacents but 1 and 8 have only 1 consecutive each in the set. I loved it and I did it but it was very challenging. Got them all in 10 min there are 4 ways. Daisy, Ole And Finley., Years 5 And 6, Beckley Primary School. We really like this challenge. You need to have 1 and 8 in the middle seats. We loved this challenge. At the start only Jamie got it but soon after about a third of the class got a solution and then most of us got it after we knew 8 and 1 need to go in the middle. We worked out there are 8 solutions, we think! I found this a real brain teaser but still enjoyed the challenge. We found this very difficult and thought it was impossible but then we saw the clue about the 1 and 8 numbers and then it took us a few seconds to get it! Nicole (aged 10) was the first! Hi, My year 5/6 class found this a challenge. However two of my super children managed to find 2 different solutions in 15 minutes! We are very proud of them!!! Kieran got this within about 2 minutes! We did this really quickly and were waiting for the rest of our class to figure it out! Abigail and Tia. Is there a harder one? Completed in 40 seconds by Chelsea, Aaron, Molly and Jason. Class captain Josh lead the way!! We loved this challenge and managed to work out the solution in the end but we had to persevere for 45 minutes. Daniel Soko, Bedwas High School. Nice and straightforward.After the first minute, it may be an idea to give a quick and evasive clew(one that was suggested by Mr Bounds was to put numbers 1 and 8 in the middle, since they had the least links with others). A pat on the back for Kym Price in Year 10 who achived her first combination within 50 2econds. We found this tricky and had to work together. We noticed a pattern with odds and evens and quickly solved it after that! My class did one solution in 1 minute. We have only found two solutions so far. Nigel Severe and Alex completed this really quickly in our year 4 class. Well done!!! Harry was the first to arrive with a solution, whilst Freddie and Fin were able to come up with all four solutions, and identify the pattern. Well done!!!! Very easy, yet very creative and imaginative! I loved it! Year 7D from Mesaieed International School managed to do get their first combination correct in about 24 minutes. They were all enthusiastic and enjoyed doing it. Mahmoud, Nadeer, Ahmed(Group Leader), Omar and Umar from Mesaieed International School, Year 10 set 1 did it in about 3 minutes. Challenged the children - they loved it. Sorted out those who persevere! I found 4 solutions in 2 mins. The year 6 children at Greenfield primary school managed to find 4 solutions. Well done guys! Mr Latheron, St Ignatius Primary School. This problem was tricky, but helped develop our skills. We solved it by finding out which numbers had the least consecutive numbers (1 and 8), then put them in the middle. The other numbers often had to be there. We found our solution had a pattern of even numbers on one side and odd numbers on the other. Most of us found this really easy. One of us did it in a minute. We found it fun!! It was very hard but it was possible the 8 and the 1 have to be in the middle. I found it very hard but when I found a clue I figured it out. After about 40 minutes of perseverance, Molly was the first in our class to find a solution. Well done, Molly :). Could a straight line be drawn on the diagram to separate the odd and even numbers? How many of the numbers are square numbers? How many of the numbers are prime numbers? How many of the numbers are triangular numbers? How many of the numbers are cube numbers? Which numbers are factors of other numbers in the diagram? Which numbers are multiples of other numbers in the diagram? Which row of seats has the largest sum? Which row of seats has the smallest product? Which row of seats has the largest mean? Which row of seats has the smallest median? Which row of seats has the largest range? Consider the four digit number made from the digits in the central column. Is it divisible by 2? Is it divisible by 5? Is it divisible by 9? Is it divisible by 3? What is the quickest way to find the sum of all the numbers in the diagram? What number is at the bottom of the diagram? What number is to the left of the eight? What number is in the same row as two square numbers? What is the difference between the numbers at the top and bottom of the diagram? What number is in between the lowest two numbers? What number is in between the two largest numbers? Add up all four numbers in the left and right columns. Here is a printable version: Not Too Close Questions. My class just completed this in 15 minutes. It was great fun! Our Yr5 class found it very challenging but we finally got to the solution with the clue of 1 and 8 being in the middle! It was frustrating but enjoyable and we all felt relieved when we solved it just before break time! This starter has scored a mean of 3.6 out of 5 based on 328 votes. 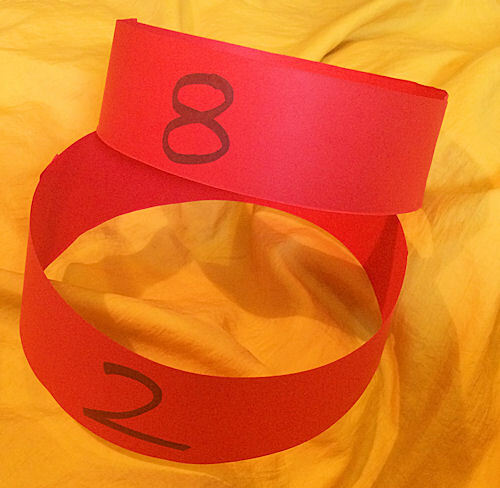 What is special about the students numbered 1 and 8? Could they sit on any other chairs? Arrange the numbers on the squares so that the totals along each line of three squares are equal. There are five levels of difficulty and the fifth level is very hard. Transum trophies are available. Other Maths activities that can be done for 'real' can be found on the People Maths page.